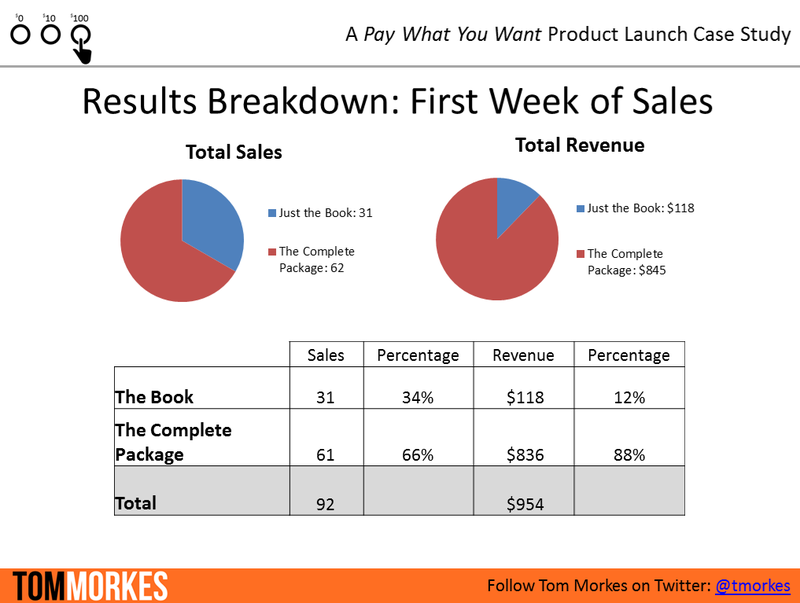 In this report, I’m going to share with you the behind the scenes look at how I launched an ebook: The Complete Guide to Pay What You Want Pricing that resulted in over $1,000 in sales in the first two weeks of release. If you’re getting ready to do your own launch – whether Pay What You Want or fixed price – this report will show you what to do (and exactly what NOT to do) so your launch is a success. If you have any questions, or would like me to clarify any part of this, don’t hesitate to email me: tom at tommorkes.com. I always try to respond as fast (and in as much detail) as possible. If you’re reading this, you ARE The Resistance. I started using Pay What You Want pricing (PWYW for short) back in March of 2013 as an experiment with the release of my book: 2 Days With Seth Godin. The book itself was a compilation of notes (over 60 pages worth) I took while at a 2 day Seth Godin seminar / meetup. Truth is, it wasn’t really a book – not in the conventional sense. From that perspective, it was a difficult book to price. But beyond that, I didn’t want to sell the book – I wanted it to be freely available to anyone, no matter their financial situation. One thing I did know I wanted, though, was validation – both for the book and all the other work I had done up until this point (hundreds of blog posts, several guides and books, a podcast, etc – all of which I gave away freely). This means I needed to add a money exchange to the equation (this is the only way to get real validation)…but how could I do that without creating a barrier to entry for some people who didn’t have the funds to pay for the book? That’s when I found Pay What You Want. Pay What You Want is a pricing technique that allows the customer to choose his or her price (rather than the price being set by the producer). A completely unorthodox pricing technique to be sure, but I had nothing to lose. To be honest, I didn’t think I’d make a dime. I released the book and let my readers know they could take it for free…but, if they liked the work I had done up to that point, they could contribute a few dollars to support my creative work. Instead of a bunch of people grabbing my book for free, I made close to $500 in the first month. I was completely shocked – I never expected people to pay money for something they could get for free…but here they were, not only giving money but giving generously (sometimes as much as $50 – $100). The surprise success of 2 Days led me to test out Pay What You Want with a bunch of other stuff. Since then, I’ve released several products as PWYW – from guides to workbooks to CDs. I’ve had a lot of success (and some failures). Each project has helped me to understand not only my own audience better, but how PWYW actually works. In August of 2013, I documented the results of my PWYW book 2 Days With Seth Godin on ThinkTraffic.net (now Fizzle.co) and later my blog. Does it work for services? Does it work for brick and mortar businesses? Is this a sustainable way to make a living? I was blown away by the incredible amount of interest in the subject. What I had done as a small (but happily successful) experiment was something people wanted to know more about – a LOT more about. How can others use this information in an easy and intuitive way that actually creates results (in other words: makes them more money than fixed pricing)? After I’d collected hundreds of examples of PWYW being used successfully (and, in some cases, unsuccessfully), I began synthesizing this data into a useable framework. I continued to collect, analyze and synthesize data over the course of 3 months (over 6 if you include my personal tests and tracking I did with Pay What You Want prior to creating the guide). Figuring out the ins-and-outs of such a unique pricing model was time intensive but extremely rewarding work (especially knowing I was answering a question that many people wanted to know the answer to). When I finally launched, I made over $1,000 in less than two weeks. In the following pages, I’ll show you exactly how I did it (and how you can apply it to your own product launch). How do I deliver this content? There are lots of ways to deliver content online, including: eBooks, eGuides, eCourses, and Membership websites (among others). From a purely ‘value’ based standpoint, eCourses and membership sites can sell for the greatest amount. But membership sites require a serious commitment to updating content every month, which means income from new members would be much less passive than an eCourse. With that in mind, I decided to create an eCourse. Out of the various options that were available, I thought an eCourse would be considered the highest value and still deliver the content in the best way possible. I created 6 modules, scripted out over a dozen videos and started recording the screen captures using a PowerPoint template to highlight specific content as I taught. While it was looking great, midway through developing the course I decided that this information would be better digested as an in-depth PDF (plus additional bonus materials for those who really want to master Pay What You Want pricing). Not sure – it just felt right. I figured the product would be better this way, and I believe it is as a result. But what I failed to consider was the impact that changing the medium in which the information was delivered (eGuide vs. eCourse) would so dramatically impact its perceived value (more on this later on in this report). I announced the guide officially at the beginning of November, 2013 to my newsletter – The Resistance Broadcast. I figured I was close enough to finishing the project that I wanted to set a hard and fast deadline to ship, otherwise I’d let it trail into December or possible into the new year (and that was the last thing I wanted to happen). I’m a perfectionist by nature. If I don’t create a no-s*** ship date, I’ll never launch because it will never be perfect (at least for me). I know I’m not the only creator out there like this. The solution? Set your ship date and set it early in the process, ideally before you even begin work (then chunk and thrash to make sure you can safely hit the deadline). Commit to it (one way is by announcing it to your audience, which puts a serious amount of pressure on you to ship on time). It might be painful to finish your work by a set date, but it’s necessary. I chose 25 November arbitrarily – I simply wanted to have something ready to go before December. I also figured tying it in with Thanksgiving might encourage people to be more generous, (although I can’t confirm or deny this actually worked). Prior to the launch, I wrote about 3 in-depth articles on the concept of Pay What You Want – what it is, how it works, and how it can help make you more money than fixed pricing. Something interesting I noticed was that as I started to write on this topic, I got more subscribers than usual to my newsletter. It may sound like common sense but it’s worth a reminder: if you’re getting ready to release a product, make sure you talk about the topic and the product itself consistently for several weeks before you launch. It might seem like you’re beating a dead horse, but the truth is your readers / customers WANT to hear about it, and any new subscribers you get will be qualified leads already.  Besides writing for my own blog (where I spend the majority of my time and effort crafting and creating content for my readers), I linked up with a couple podcasters to do interviews. One I reached out to, the other found me through a mutual friend. Both podcasts aired their episodes on the week of release (coincidence), which let me share the content with my readers at the perfect time. I also wrote up an article for Medium.com (a publishing platform that lets just about anyone write for it). I’m the type of person who will spend 99% of my time crafting and creating content and about 1% marketing it. The problem with this is that, besides my own readers, no one knows what I’m working on or why it matters to them. For a topic like PWYW, that’s doing a disservice to the artists and entrepreneurs out there looking for a better way to sell their products and services. The only person who can truly market your content is you (and to ignore this means ignoring sales and revenue down the line). The Medium.com article ended up doing way better than expected. In the first day, the article caught the attention of Medium curators and they tweeted it out to their twitter list. This brought in thousands of readers to my article in just a few days. I was getting ready to launch the guide the next day, so I immediately released the book and linked to it from the article, to hopefully capitalize on the attention. I netted 20 sales worth $80 from this. Not a huge amount, but not bad for one article. *note: the article also helped me get dozens of new twitter followers and subscribers to my list. So while it didn’t have the impact of guest posting on a website with a particular target audience (like my Think Traffic post), I was pretty happy with the results. When the guide + bonuses were finally ready to ship (literally the day before launch…I didn’t give myself anywhere near enough time to properly prep this launch, if you haven’t noticed), I sent them to a couple dozen friends of mine with audiences online, and I asked them to share it with their audiences if they found the book and content at all helpful. They all ended up sharing it on Twitter at least once (and on a couple occasions, multiple times or on Facebook). The result? 2 sales from Twitter for a total of $39 and 5 sales from Facebook for a total of $85. Getting people with large audiences to help promote your book on Twitter or Facebook does not bring in as much exposure as you’d think (or at least not as much as I was hoping for). That said, it definitely didn’t hurt. At the end of the day, if you can get tweeted / shared by the same person to the same audience several times – that definitely improves conversion and sales (but it’s also something you can’t demand nor count on unless you’ve made a prior arrangement). But even that isn’t nearly as effective as getting mentioned in someone else’s newsletter. One of the best uses of your time and energy is to coordinate with peers who have similar audiences to share your work with their audience via their newsletter (preferably in a series of 2 or 3 emails making reference to the work). Usually, you’ll need to offer an affiliate commission to get people on board to do this, but could be well worth your time. I didn’t have enough time to properly coordinate this for my product launch, which means I lost out on potentially dozens (or hundreds) of sales. However, I’ve seen the tactic used to great effect for others who released similar style information products. The key is to target audiences that are similar to yours and could benefit from what you’re offering. *note: you will see this tactic used all the time if you subscribe to any newsletter for a period of time, so subscribe to a few and study them if you’re interested in exactly how to do this. I mentioned earlier I originally started creating an eCourse around Pay What You Want, but switched it to an eGuide midway through the product’s development. This shouldn’t have been a big deal, but I made a couple mistakes that cost me a lot of potential revenue. When it comes to selling content online, readers are generally aware of price ranges for certain types of products, and they’re usually savvy to the pricing of comparative, competing products. When you think ‘eBook’, you probably picture an Amazon Kindle book priced from $2.99 to $9.99. For many of us, this price is anchored in our mind. Therefore, if I’m writing an eBook, I’m forced to contend with this price anchor. Which means writing an eBook is not a great idea if you want to make decent money from your writing. Guides and Reports aren’t anchored the same way as eBooks. Guides and Reports can sell from anywhere from $19 – $199+ depending on the material, the industry, etc. I’ve seen (and purchased) such guides and reports for over $200, so I know what is required to price a product at a premium like that. That’s why I put so many bonuses into ‘The Complete Package’ of my product – I wanted something that was easily worth $249. I failed to convey this value to my readers and customers. Instead of clearly defining the benefits of what ‘The Complete Package’ will do for the user, I only explained the features (if people contributed over a minimum amount they get 12 bonuses, from cheat sheets, to video tutorials to expert interviews to a half dozen case studies, etc). It doesn’t matter how many features your product has – what matters is the impact those features have on the end user. Focus on showing the customer the benefits of what you’re selling by explaining the impact of each feature. The greater the benefits, the greater the value. Had I continued with the eCourse version of this product, I have no doubt readers would have valued the product much higher by default. A guide or report could similarly sell for quite a bit, but there’s more work involved in explaining what differentiates a guide or report from an eBook (whereas an eCourse is already price-anchored in many readers minds in the several hundred dollar category). The day I announced the guide (to a subscriber list of 444 people), I received about 30 preorders worth over $200. Not bad, certainly…but way below what I expected (I’ll explain below). When it came to perceived value, I made things worse by ‘discounting’ the minimum contribution to receive bonuses for subscribers who preordered the product before it launched on 25 November. In hindsight, this doesn’t make sense. Think about it – the product is Pay What You Want…why would I discount it? What effect does that have on the reader or customer? And why would any reader contribute more than that discounted minimum (if the incentive is a lower price, then I’m basically telling them they ought to contribute less)? I didn’t realize this until after the fact, but by giving a discounted price for early subscribers I was actually DEVALUING what I had spent months creating. Instead of dealing with the standard eBook price anchor, I made things worse by lowering the minimum contribution to $4+ for all the bonuses. The biggest problem with this is that it completely defeats the purpose of generosity. 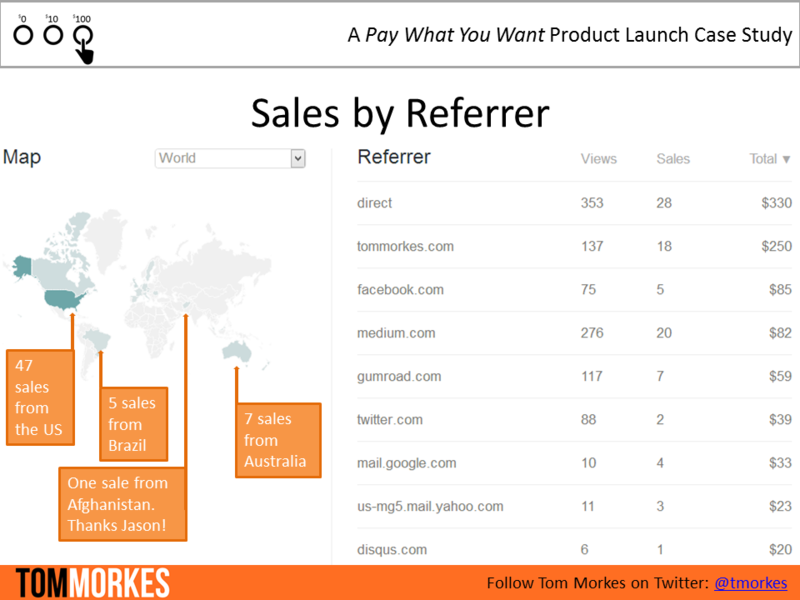 The whole point behind why I use PWYW is to run a generosity-based business (for my writing and content on Tommorkes.com). By lowering the minimum to get the bonuses, I effectively said to my audience: don’t be generous – contribute less. Instead of lowering the minimum price for the bonuses, I should have included exclusive bonuses (that can’t be purchased later on) for those who contribute early and generously (perhaps exclusive case studies, interviews or videos). This type of incentive is congruent with the message I’m trying to send with my products, and it gives people a REASON to contribute generously (and early). Lucky for me, while I botched my PWYW pre-launch with a well-intentioned but misdirected incentive for my readers, many of them were still generous, contributing $20 or more in some cases. Even after all the mistakes I made, I still consider my launch a success. 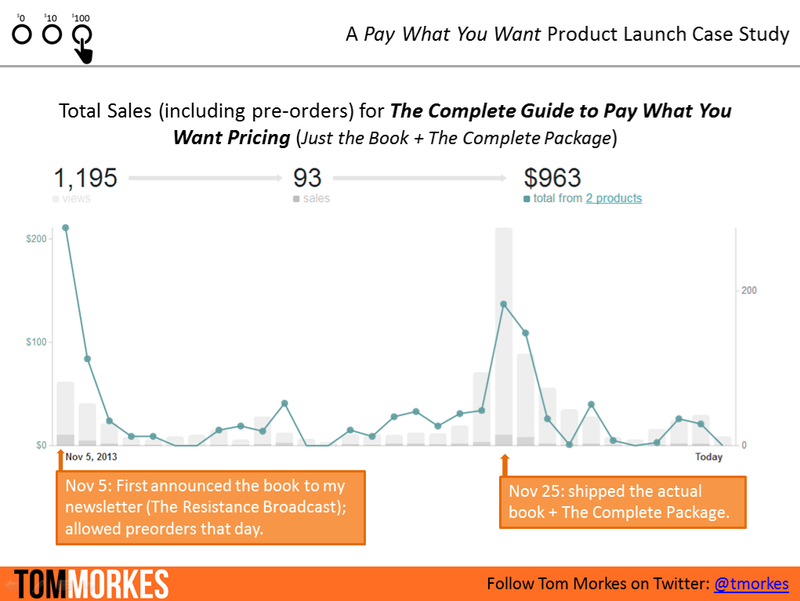 The day I announced the guide (to a subscriber list of 444 people), I received about 30 preorders worth over $200. Over the next couple days, I received about 20 more preorders, worth over $350 cumulatively. Not bad, but also way below what I could have made if I had (1) demonstrated the value of my product better to the reader, and (2) created a better incentive for contributing early (and generously). 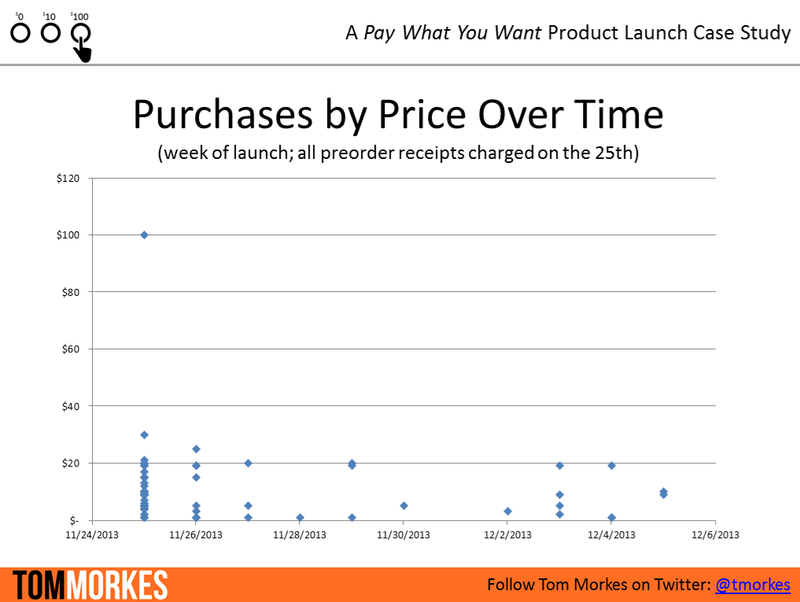 Had I made those corrections I pointed out above, I have no doubts in my mind I would have made over $800 in pre-orders the first day (assuming the same number of readers would still preorder the product at an average contribution of $20). The Complete Guide to Pay What You Want Pricing (Just the Book and The Complete Package) actually shipped the evening before launch day (25 November). This meant people who preordered should have gotten their products earlier than ship date (a good thing if you can swing it). On the day of the launch, I sent out one email to my newsletter. This brought in about $150 in sales. Many marketers will tell you to email-blast your newsletter 3 times in the days leading up to launch, and then another couple emails the day of and the day after launch. They also suggest pressuring your audience to buy by setting time limits on discounts, spaces available (if it’s a membership site), etc. I didn’t do any of this because I don’t like that style. That said, I’m also aware that when it comes to results, the numbers don’t lie: the more you market (emails through your newsletter, shares on social media, or talking directly to people in person), the more you’ll sell. Whether you like it or not, the more you market (and in this case, self-promote), the more you’ll sell. I may have missed out on sales by not sending out several emails on launch day, but my hope was that readers would notice that they weren’t being bombarded and appreciate being on my list even more (there is no way to track this, of course, so it’s all blind faith). Prior to launch day (25 November), I had accumulated over $500 in pre-orders of my guide. For reference: it took me over a month to do that with 2 Days With Seth Godin. By that standard, I had far and away exceeded my prior benchmark in much less time. The week that followed brought in even more contributors, this time with many more contributing at or above $19 (the minimum amount for all the bonuses). Within the first week of launch, I was closing in on $1000. I made $954 in sales from The Complete Guide to Pay What You Want Pricing (including both tiers: Just the Book and The Complete Package). But $954 is not what went into my pocket. 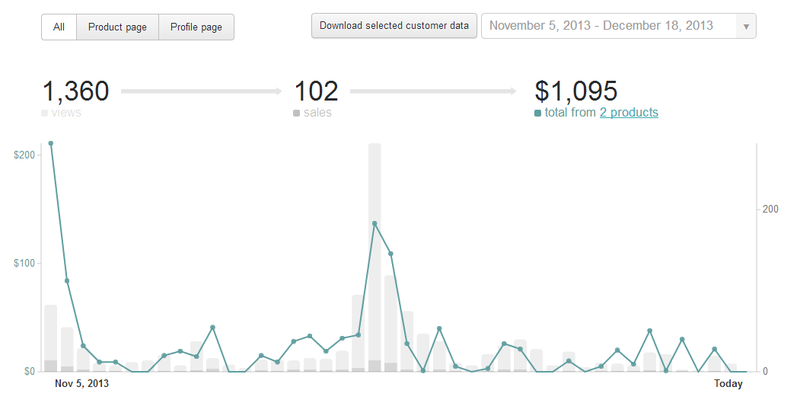 Gumroad.com, the sales platform I used to sell my products, charges 5% + $.25 per download. Since I sold 92 products, that’s -$23, and 5% of $954 is -$47.70, for a total of $70.70 out of my pocket and into Gumroad’s (of which I’m happy to pay, for the record). So now I’m down to $883.30. Because I’m a jack of all trades (I’m not really – mostly just stubborn), I did the cover design, interior design, and just about everything by myself (although I did pay $5 on Fiver.com to turn my 2d book cover into a 3d image), which helped me minimize expenses. I also had some incredible volunteers help me edit the finished product (thanks Tom and Diana Owens! ), which gave it a professional spit shine without the steep cost. So that means $883.30 is all mine, right? While this would normally all be the case, I decided to enlist the help of my brother, Seph, to help me finish the product and ship on time. Having someone give feedback as I created the material helped me to finish and polish the book and bonus materials to a very high standard (from video tutorials to interviews to cheat sheets to the workbook etc.). I told Seph that if he can help me create a quality product and ship on time, I’d split launch profit with him 50 / 50. 1. Launching on time with a great product and splitting profit is better than launching late and keeping all the profit to myself. 2. Seph is a college student getting ready to graduate. I figured the best thing he (or anyone else in his shoes) can do is learn to run an online business, not only in the short term to pay down student loan debts, but because commerce is continuing to move online, and if you don’t know how it works, you’re at an incredible disadvantage (no matter what job or business enterprise you’d like to pursue). I feel the best thing I can do is not only teach this stuff to as many people as possible, but when the time and money allows, help others learn by working directly with me. So, after paying Seph half of $883.30, I’m down to $441.15 takeaway profit. I’ve mentioned before in The Art of Instigating that many entrepreneurs, because of the hours they commit to creating something, work for sweat-shop wages. My case is no different. I worked on this project for about 1 hour a day in September, for a total of 30 hours that month (this is a conservative estimate). In October, I spent about 3 hours a day on the project, coming out to about 93 hours that month. In November, I worked on the project for about 6 hours per day for the first two weeks (84 total hours) and about 10 hours per day for the remaining 10 days (for a total of 100 hours). So after at the end of the day, my time was worth about $1.43 (ouch). I mentioned I made about$1.43 per hour from this product, but that ignores one important aspect of selling digital goods – this product is a new income stream, no matter how small, that supplements my other income. As you can see, after launch week, I’ve made another $100+ from the guide. $100 a week isn’t enough to live off of in the States in most cases, but in Bali (where I’m currently writing this from) it goes a pretty far way. What you’ll notice is that while the majority of sales came during the major announcements and hard sells of the product (5 November and 25 November), I’ve managed to maintain decent sales going forward. This is in part due to new people finding me from recent podcasts I’ve been on explaining Pay What You Want and how it works. I’ve just launched The Complete Guide to Pay What You Want Pricing. If I want to continue making sales from the guide (and spreading the message of PWYW), I need to continue to teach, market and sell the guide. This includes podcasts, video interviews, and guest posting on other blogs. So was it a success or failure? Without a doubt, it’s a success. You’ll see a lot more from me in the coming months as I teach and spread the word of Pay What You Want. Already, readers who bought the guide have told me they’ve seen an increase in sales and revenue. Mick H. was going to charge $200 per month for his client, but instead used the techniques I outline in the book. The results? The client offered to pay $500 / month. That’s a 150% increase in profit, without a single change to anything in Mick’s business model. Think about that for a second…pretty powerful stuff, right? Jimmy M. used the same techniques for his digital offering. Within the first week, he saw a spike in sales and revenue that paid for what he contributed to get the guide…10 times over, in fact. These are just two small examples, but they show the power of Pay What You Want (and the value of my guide by extension). It also tells me this message is important and more people should hear it (and use it). So, yes – it was a success (at least for me). And I’m looking forward to my next product launch…although this time I’m giving myself more than a few months to complete it. If you haven’t picked up The Complete Guide to Pay What You Want Pricing, grab The Complete Package here. If this article was informative, share it with someone you know. Every single share allows me to continue producing content for you. p.s. if you liked this report, subscribe to my newsletter (The Resistance Broadcast) to get stuff like this sent directly to your inbox about once a week. Started in Brisbane on the way to Cairns Australia (in a Juicy relocation ‘Campa’ van). Images created on a terrace off the rainy streets of Ubud, Bali. Finished the article and finalized the PDF in Jakarta, Indonesia (with the help of a quadruple shot Americano). I’m dazzled! You put so much valuable information on here that I can’t take it in in one go. What strikes me is how positive your experiences have been, with those execptions that you talk about. Most people I know have had negative experiences. It’s easy to see how doing it right will lead to more success than just doing it. Angela – thanks so much! Really glad you liked it! Truth is – Pay What You Want can fail just as easily as fixed pricing. It’s all about presentation, how you frame the offer, and how you pitch it to your readers. Tom, Wow! This is the most valuable article that I’ve read in a very long time. This report is incredible – and timely. I’m going to be launching my first product on April 2nd so this is perfect. I gotta say, ‘Pay What You Want’ is an intriguing concept and I hadn’t seriously considered until recently. I’m not sure that I will employ the PWYW model for my upcoming launch (due to it being a collaboration with someone else) but the insights that you offer on conducting a successful launch are incredible. I have a list of 6 items that I hadn’t considered. Congratulations on a successful launch! And for brilliantly capturing the metrics of your successes and failures along the way. That alone is worth so much more than $1.43 per hour. 😉 Also, if you’re interested in doing a video interview for my show http://www.thestartupsessions.com/ let me know. I’ve got a steadily growing audience of mostly side-hustlers that might find PWYW interesting. Michael – thanks so much. So glad it was helpful. Let me know if you need any help putting PWYW to work. Would love to be on your show. Will shoot you an email shortly. Wow Tom what a great article! So detailed! I love your step by step descriptions about your processes, ideas, and metrics. I never thought of a PWYW model working – like you thought, it seems like people would just download your stuff for free all day!! That is excellent that you did (and do you always do?) 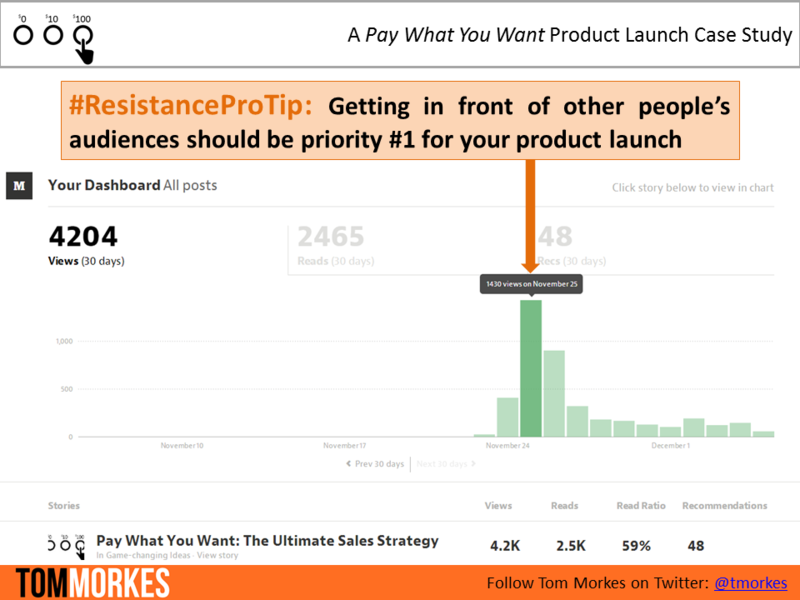 such an in-depth analysis of your product launch and what worked and what didn’t. Through this type of a cycle, it will get even better and better! Most people won’t spend so much time and effort on the evaluative phase of producing. But it is for future benefit! Thank you so much for sharing everything in it’s entirety for us all to enjoy and benefit from! You give much food for thought!